Want to be a part of camp outside of summer? 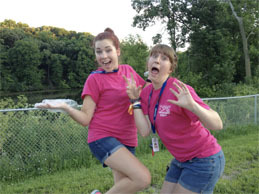 Camp High Hopes looks for enthusiastic camp counselors for our Fall & Spring seasons. Typical contract runs early September thru Late April. Please click on the job title below for more information about different positions. Interested applicants can also email hr@camphighhopes.com, or call 712-224-2267 x102 for further information. To apply: use our Online Application. Become a Smile Maker in Summer 2019!!! Summer 2018 is already underway, but don’t worry Summer 2019 is under a year away! For each of our campers, it is really the counselors, activity leaders, and our whole team of amazing individuals that make our campers smile and create such a unique and inspiring place for campers to be their best selves. Have no doubt, each of our Smile Makers impacts our campers lives in positive ways. Become a Smile Maker and you know, even when it is unsaid. To apply: 2019 applications will be accepted starting October 1st, 2018 via our Online Application Starting October 1st, 2018. Please click on job title below for more information about different positions. Interested applicants can also email hr@camphighhopes.com, or call 712-224-2267 x102 for further information. To apply: 2019 applications will be accepted starting October 1st, 2018 via our Online Application. Positions listed below. Support staff are part-time employees who assist with dietary and facility support needs, such as serving meals and general grounds maintenance. Please click on the job title below for more information about different positions. Interested applicants can also email hr@camphighhopes.com, or call 712-224-2267 x102 for further information.